Joy to the world! It’s the festive season and the one time of year when we can be let out of our offices and blend in with ordinary members of the public. Yes, it’s Halloween and this year we have delicious treats that come in black ‘n’ roll flavour. Purveyors of John Carpenter inspired death metal that comes replete with catchy sludge-laden riffing; Merseyside’s Video Nasties have made a seismic impression on the metal underground since their formation in 2017. 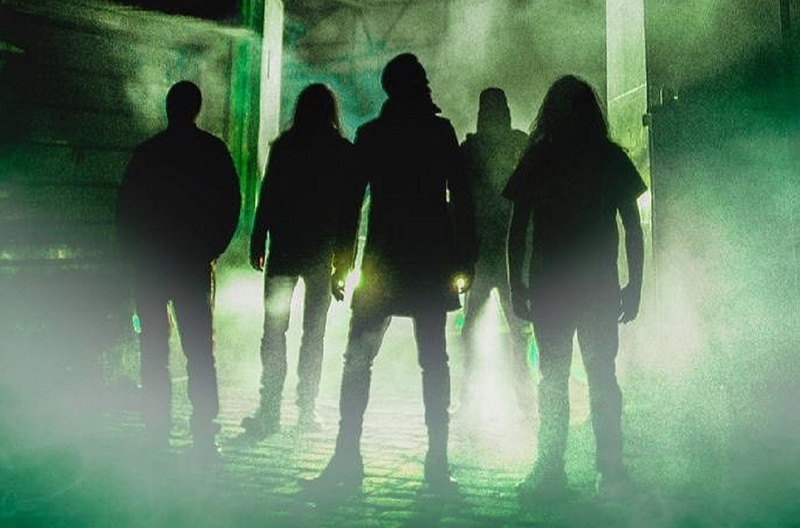 After a busy period of live tour dates that included supporting Cannabis Corpse and The Obsessed, we caught up with the guys to get the lowdown on their future plans and insights into their horror influences. Featuring former members of Iron Witch, The Bendal Interlude, Magpyes and SSS, Video Nasties can aptly be described as a Merseyside metal supergroup. Transvoltum is Latin for ‘call of the void’ and, as the promo video for the track demonstrates, it is inspired by horror master John Carpenter’s 1987 film Prince of Darkness. Anyone who has seen Video Nasties play this song live will appreciate that this horror film influence is a central part of their aesthetic. If Transvoltum and latest single Viva Deth are anything to go by, we reckon that record could be something truly special. As if we hadn’t given you enough treats, in the spirit of the season Video Nasties gave us their rundown of the top John Carpenter films everyone needs to see before they die. One of the most influential horror films of all time, Halloween set the template for the slasher genre. As magnificent for its haunting soundtrack and score as it is for its depiction of terrifying bogeyman Michael Myers, Halloween is essential viewing for any horror fan. Part road movie, part action flick, part sci-fi, Escape from New York is one of Carpenter‘s most enjoyable films. Once again, this is partly down to a high quality score that perfectly matches the post-apocalyptic setting. Kurt Russell is brilliant as Snake Plissken, an anti-hero tasked with rescuing the US President (played by the late Donald Pleasance) from New York, which has become a lawless penal colony ruled by gangs. Carpenter followed up his breakthrough in Halloween with this classic ghost story that is peppered with genuinely creepy moments. Antonio Bay is a coastal town hiding a terrible secret and, on the eve of its 100th birthday celebrations, a curse is about to be realised as an eerie fog rolls in hiding undead creatures hell bent on revenge. As with Halloween, the tension is cranked up by a fantastic score and the film’s moments of terror lie not in what the audience actually sees (this is not a gory film) but in what they think they have seen. Tasked with bringing Stephen King’s novel of the same name to the big screen, Carpenter’s Christine is an underrated film within his overall canon. Keith Gordon is terrifying as Arnie, an awkward virginal teen whose coming of age can only be achieved at a horrific price after his possession by ‘Christine’, a 1958 Plymouth Fury. The soundtrack is excellent once again, particularly during the highly effective set pieces near the end of the movie when Christine destroys the cruel bullies who had previously made Arnie’s life a misery. This film conveys a powerful claustrophobic atmosphere as it portrays the eve of Armageddon during which scientists must do battle with the Antichrist who is slowly re-awakening in the catacombs of an old church. The dream sequence that is a premonition of the future under the rule of the Prince of Darkness is especially effective. It is little wonder that Video Nasties chose to use this sequence in a sample during Transvoltum.